L — staggered nail pattern reduces the possibility for splitting. LS — field-adjustable 0° to 135° angles. The GA gusset angles' embossed bend section provides added strength. GA angles may be installed with 0.148" x 3" nails. GA1 uplift is 425 lb. for DF and 300 lb. for SPF when installed with Strong-Tie® SD Connector screws. GA2 uplift is 370 lb. for DF and 260 lb. for SPF when installed with Strong-Tie® SD Connector screws. Fasteners: Nail dimensions in the table are listed diameter by length. SD screws are Simpson Strong-Tie® Strong-Drive® screws. 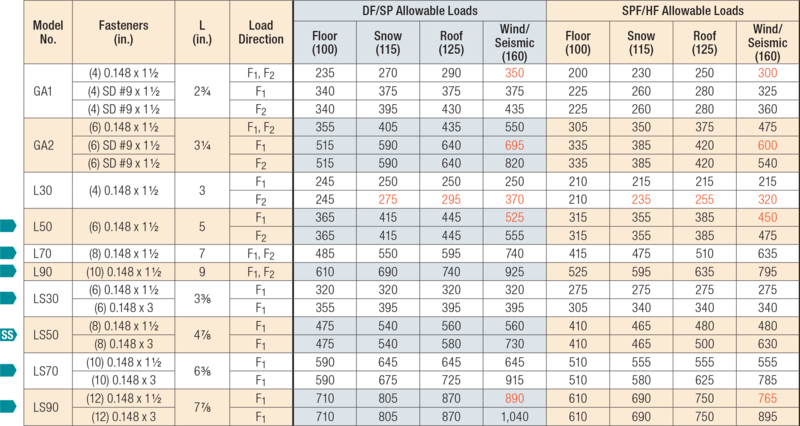 For additional information, see Fastener Types and Sizes Specified for Simpson Strong-Tie Connectors. SSA10d nails are Simpson Strong-Tie® stainless steel ring shank nails. NAILS: SS10d and SSA10d = 0.148" dia. X 3" long. See other nail sizes and information. GA See specific model numbers for code listings. GA1Z No evaluation report listing. LS See specific model numbers for code listings. LS50SS No evaluation report listing.